Fill the mobile number and email address in the space provided. Select the number of policies you want to update the contact details for. One can update the details for a maximum of 10 policies at a time. Check on the declaration and click on submit. In the next landing page, enter the policy numbers in the space provided and click on "validate policy details." The website will check to see if the name and date of birth in the policy records matches with the details provided by you. A pop-up will appear on successfully updating the details. The pop-up includes a request number that you can note down for future use. 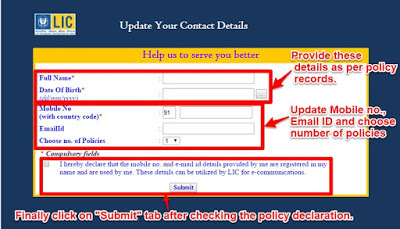 You will receive a phone call from the LIC customer care to verify your number and an email on your address. On verification, the details will be updated for the policy. You can use the same method to update an old number that you may have been using earlier. 2. Call Customer Care You can call LIC's helpline on 022-68276827. This is a 24/7 service. 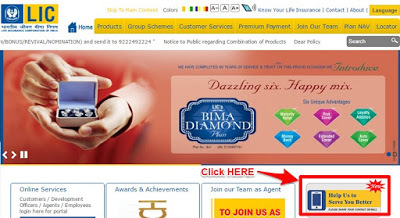 CLICK HERE FOR LIC OFFICIAL WEBSITECLICK HERE FOR UPDATE YOUR INFO.